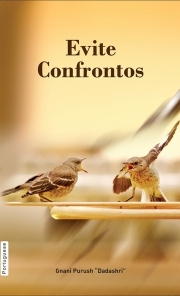 Description of "Avoid Clashes (In Portuguese) (eBook)"
As much as we would prefer otherwise, life includes its measure of unpleasant and unfavorable circumstances. In dealing with difficult people, facing unhealthy relationships, in family relationships, or in the midst of marriage problems, clashes occur. We might even say that some of our relationships are the very definition of conflict! We ask ourselves, how can we possibly avoid conflict in these emotionally-charged situations? In the book “Avoid Clashes”, Gnani Purush (embodiment of Self knowledge) Dada Bhagwan offers ultimate conflict resolution skills in the form of spiritual conflict resolution strategies. His spiritual teaching on how to resolve conflict - or to avoid it altogether - is offered in the context of common and everyday relationship challenges. Whether seeking relationship tips, marriage advice, or to learn how to deal with negative people and difficult people, this book will prove an invaluable resource. Reviews of "Avoid Clashes (In Portuguese) (eBook)"